A red blazer and grey ripped jeans are essential in a functional off-duty sartorial arsenal. Amp up your look by slipping into black leather pumps. This laid-back pairing of a black and white chevron sweater dress and a black tank is a never-failing option when you need to look stylish but have no time. Add a hint of sophistication to your ensemble by slipping into a pair of Gucci black leather pumps. Make a white floral skater dress your outfit choice for an effortless kind of refinement. Complete this look with a pair of Gucci black leather pumps to completely jazz up the outfit. Demonstrate your sartorial know-how by opting for a red and navy print sheath dress. 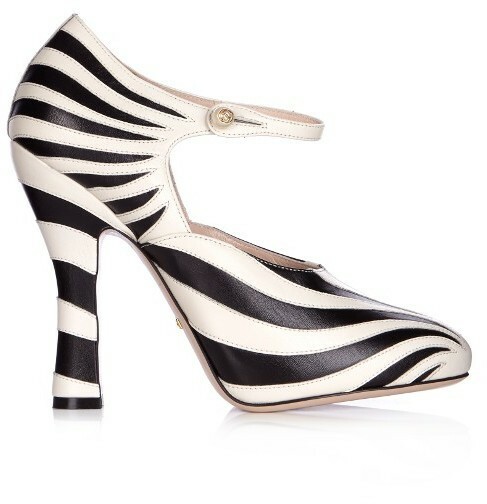 If you're not sure how to finish, a pair of Gucci Lesley Zebra Appliqu Leather Pumps from MATCHESFASHION.COM is a nice pick. This pairing of a light blue horizontal striped coat and black ripped skinny jeans is proof that a pared down casual look doesn't have to be boring. Gucci black leather pumps are guaranteed to infuse an extra dose of polish into this look. As you can see here, looking chic doesn't require that much effort. Reach for a dark green velvet sheath dress and you'll look chic. As for footwear, complement this getup with a pair of Gucci Lesley Zebra Appliqu Leather Pumps. Reach for a black jumpsuit for a cool look. You can take a more elegant route with footwear by wearing a pair of Gucci Lesley Zebra Appliqu Leather Pumps from MATCHESFASHION.COM. Master the casually stylish outfit by opting for a brown trenchcoat and black leggings. And if you wish to instantly lift up your look with one single item, why not complement your look with Gucci Lesley Zebra Appliqu Leather Pumps? For something more on the casually edgy side, opt for this pairing of a black crew-neck sweater and a white and black check pencil skirt. Add Gucci black leather pumps to your ensemble to avoid looking too casual.